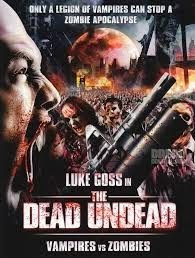 THE DEAD UNDEAD deals with a group of Actor's Equity stuntmen (led by HELLBOY II's Luke Goss) who play inept vampires hunting vampire zombies, or ZVs for short. Typical young adult LA actors get caught in the crossfire, which all of the action seems to take place in the same one acre location. At night. This stuntman's demo reel is currently available for streaming on Netflix and VUDU, but as always, you're better off saving the crash pad and just listening to us take the high fall. We also welcome Gladys Bronski, our newest cleaning lady here in the Restroom. Gladys will be taking over the Writing On The Restroom Wall portion of our show.